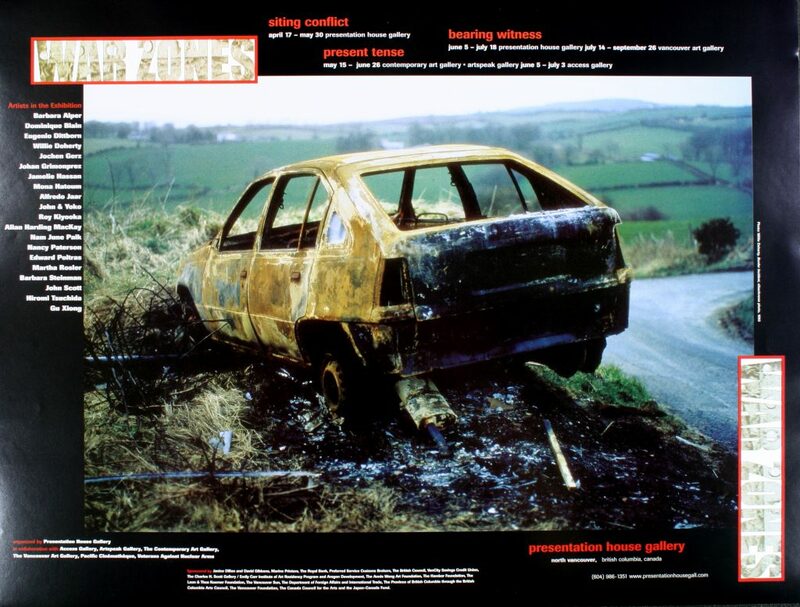 War Zones presents photo and media - based art work concerned with situations of conflict on the late Twentieth Century. 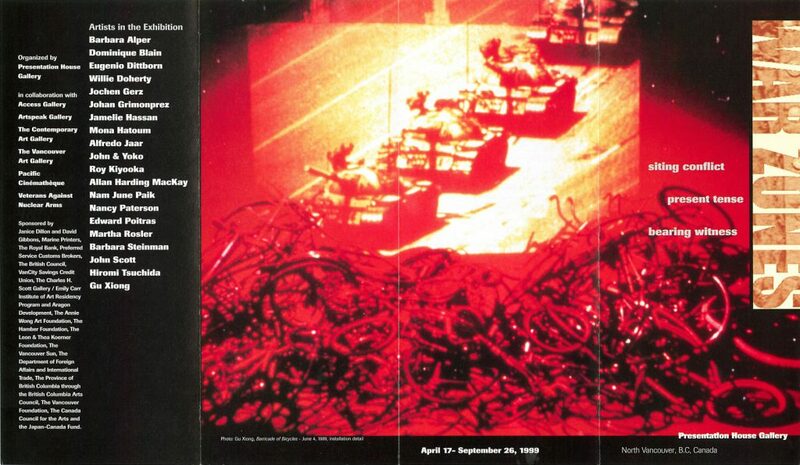 The works, by an international selection of contemporary artists, are divided into three sections: Siting Conflict, Present Tense, and Bearing Witness. The project beings in April and spans the summer into September, and involves a number of venues and collaborators. Contemporary artists interact with the context of war by creating images and objects which encourage memory and reflection, memoralize and criticise, mark sites and physical traces in order to evoke their implications for the past and for the future. The art works are fragments, artifacts, representing one position within the diverse range of experience. The exhibitions are not a comprehensive survey of the history of war, no does it address the politics of any one conflict in depth, but as a whole it provides a context for reflecting on what French theorist Paul Virilo has called the "merciless" century, and on implications for the future. A catalogue was published by Presentation House Gallery in conjunction with the exhibition, and includes essays by Sue Malvern, Zdenka Badovinac, Bob Sherrin and an introduction by the curators Karen Love and Karen Henry. Sponsored by Janice Dillon and David Gibbons, Marine Printers, The Royal Bank, The Charles H. Scott Gallery / Emily Carr Institute of Art & Design Residency Program and Aragon Development, Simon Fraser University Graduate Liberal Studies Program and the Leon & Thea Koerner Foundation Lecture Series, Preferred Service Customs Brokers, The British Council, VanCity Savings Credit Union, The Annie Wong Art Foundation, The Hamber Foundation, The Leon & Thea Koerner Foundation, The Vancouver Sun, The Department of Foreign Affairs and International Trade, The Province of British Columbia through the British Columbia Arts Council, The Vancouver Foundation, The Canada Council for the Arts and the Japan-Canada Fund, as well as participating organizations. April 15, noon | Artist talk by Willie Doherty, at ECIAD Lecture Hall. Organized in cooperation with ECIAD Residency Program. June 8, 1-5pm | Producers workshop with Johan Grimonprez; introduced by the artist. Co-presented by Presentation House Gallery, PC and Veterans Against Nuclear Arms. 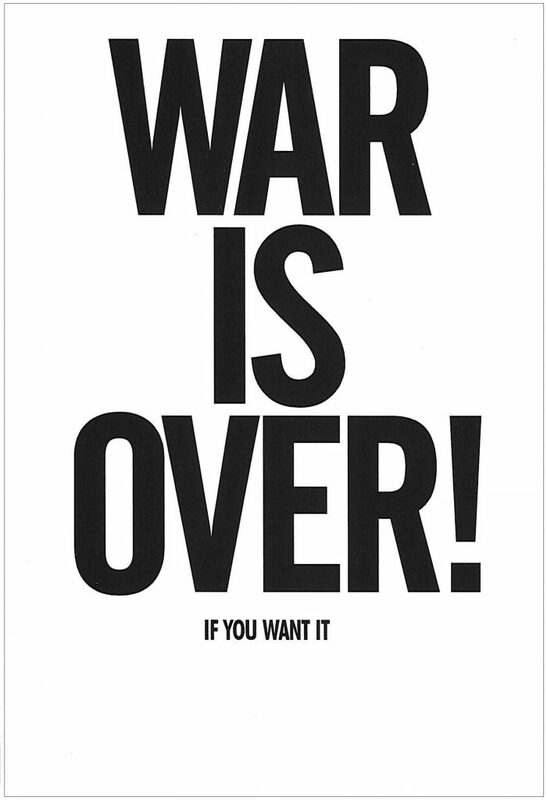 War Zones is a program of exhibitions and special events held in collaboration with Access Gallery, Artspeak Gallery, the Contemporary Art Gallery, the Vancouver Art Gallery, Pacific Cinemathque and Veterans Against Nuclear Arms, the Western Front and Video In. 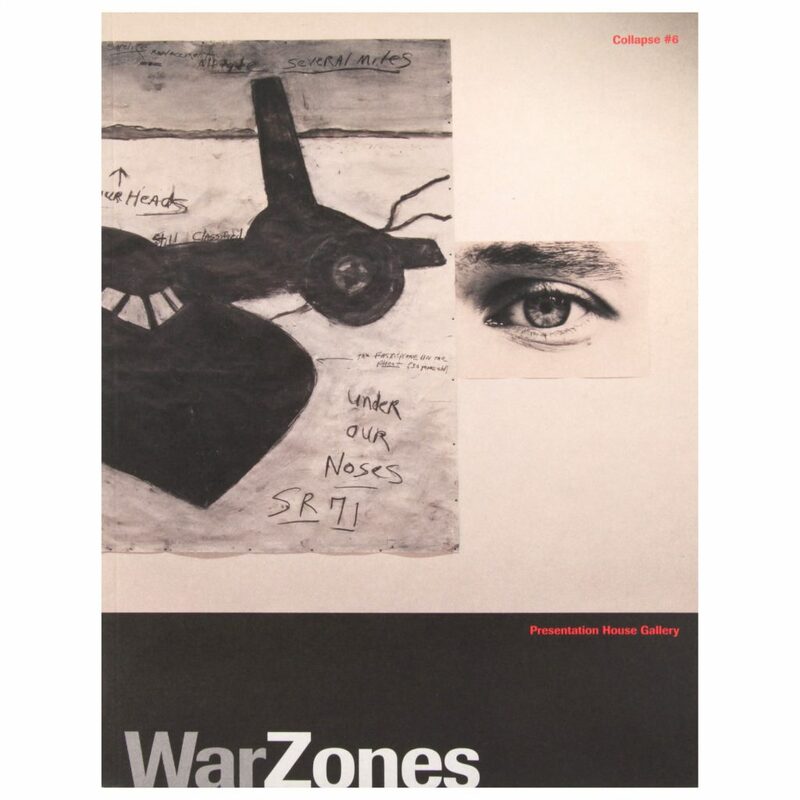 Poster for the exhibition "War Zones"
The 1999 exhibitions that comprised War Zones featured photography and media-based works by an international selection of artists who look at memories and ideologies associated with war. 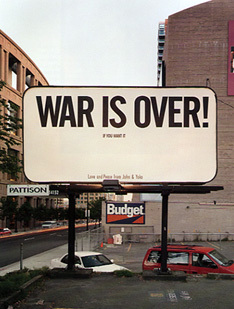 WAR ZONES artists were Barbara Alper, Dominique Blain, Willie Doherty, Eugenio Dittborn, Jochen Gerz, Johan Grimonprez, Jamilie Hassan, Mona Hatoum, Alfredo Jaar, John & Yoko, Roy Kiyooka, Allan Harding MacKay, Nam June Paik, Nancy Paterson, Edward Poitras, Martha Rosler, John Scott, Barbara Steinman, Hiromi Tsuchida and Gu Xiong. The program included off-site billboard works, a film series, panel discussions and artists talks. 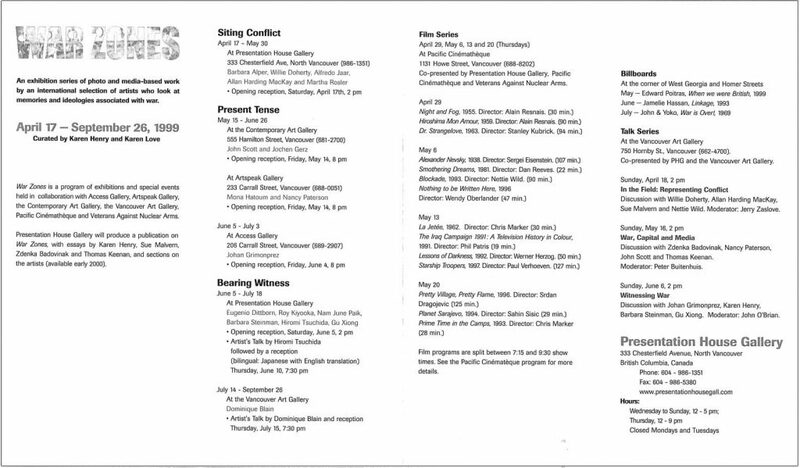 Curated by Gallery Director Karen Love and guest curator Karen Henry. 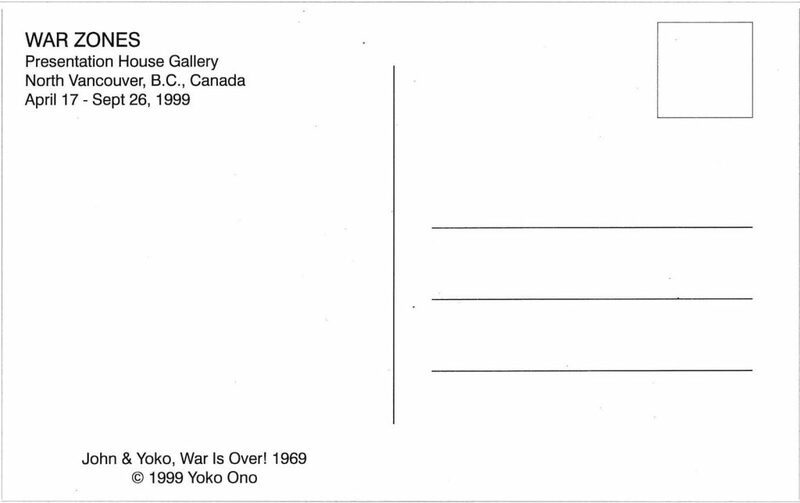 The exhibitions and special events were organized in collaboration with Access Gallery, Artspeak Gallery, the Contemporary Art Gallery, the Vancouver Art Gallery, Pacific Cinémathèque and Veterans Against Nuclear Arms, the Western Front and Video In.